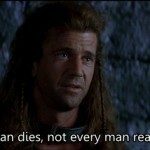 William Wallace: Aye, fight and you may die. Run, and you'll live… at least a while. And dying in your beds, many years from now, would you be willin' to trade ALL the days, from this day to that, for one chance, just one chance, to come back here and tell our enemies that they may take our lives, but they'll never take… OUR FREEDOM! Seize the day. Because, believe it or not, each and every one of us in this room is one day going to stop breathing, turn cold and die.